Throughout the month of December, Glen Prairie (1250 Roosevelt Rd., Glen Ellyn; 630-613-1250) offers a three course prix fixe meal available after 5 p.m. for just $20 per person. Crafted by executive chef Daniel Ovanin, these seasonal specials feature locally-sourced ingredients. 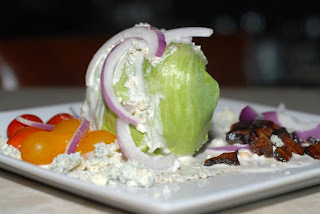 For the appetizer, try the Baby Wedge, applewood smoked bacon, fresh tomatoes, red onion and crumbled bleu cheese dressing. Entrée selections include a choice of either Simply Grilled Atlantic Salmon, shoestring potatoes, whole grain mustard, fennel and blood orange salad; or Maple Leaf Farms Duck Leg Confit, white bean cassoulet, smoked sausage and maple gastrique. Indulge in a choice of Daily Sorbet for dessert. To make a reservation, call (630) 613-1250 or visit http://www.glenprairie.com/.